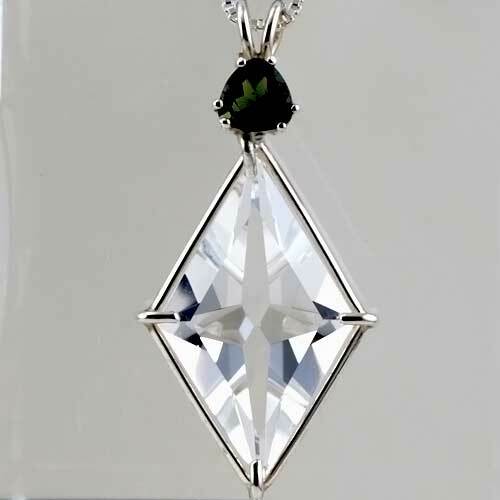 Dimensions (HxWxD): 1.6" x 0.8" x 0.2"
This amazingly beautiful water clear Ascension Star Pendant is crowned with a sparkling, highly faceted trillion cut Moldavite gemstone, and offers tremendous protection & connection to the Higher Self. It is set into a sterling silver setting which allows the stone to breathe, and hangs on its sterling silver chain right on the thymus between the throat and the heart chakras, offering protection to the whole body resonating through the compassionate heart. This pendant comes in its own velvet jewelry box. The Ascension Star cut assists us in bringing in the energy of the Divine and grounding it into our earlthy experience. As our daily experiences are touched and guided by this Divine energy we raise our vibrational frequency to move into harmony with all of creation. This unique tool is fashioned to assist us along our path of conscious evolution - "ascension" from the everyday consciousness of separation marked by dominion of the egoistic personality and into the higher realms of unity consciousness. Quartz is the low-temperature stable form of silicon dioxide or silica.Silicon and oxygen are the two most common elements in the Earth's crust.Quartz crystal is perhaps the most common mineral found on the face of the Earth. Sand and sandstone are considered “clastic” forms of quartz by mineralogists, meaning that they are formed of fragments of pre-existing rocks. Read the rest of the article Using Quartz Crystals in Digital Technology, Healing and Meditation for an overview of the metaphysical and mineralogical properties of quartz, and a step-by-step guide explaining how to cleanse, charge, and program quartz crystals for healing, meditation and other spiritual purposes, and you can read about Marcel Vogel and his method of crystal healing in that article. Note: Weight above is shipping weight. Net weight of this pendant is .25 oz. Each piece is unique and may vary slightly in appearance. Each piece is guaranteed to be beautiful and to meet with your complete satisfaction!